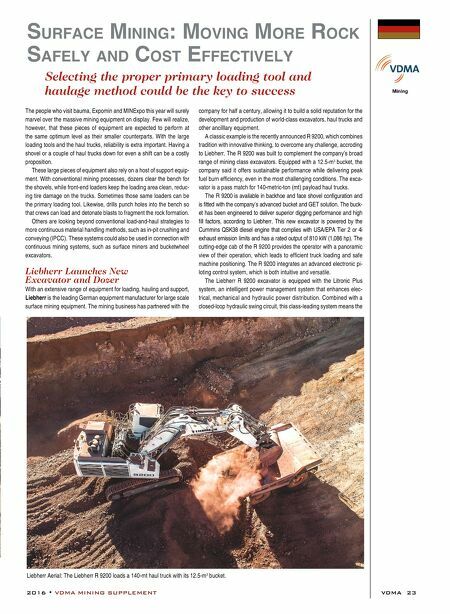 2016 • VDMA MINING SUPPLEMENT VDMA 23 s ur F a C e Mining: Mo V ing More r o C k s a F ely and Cos T e FF e CT i V ely Selecting the proper primary loading tool and haulage method could be the key to success The people who visit bauma, Expomin and MINExpo this year will surely marvel over the massive mining equipment on display. Few will realize, however, that these pieces of equipment are expected to perform at the same optimum level as their smaller counterparts. With the large loading tools and the haul trucks, reliability is extra important. Having a shovel or a couple of haul trucks down for even a shift can be a costly proposition. These large pieces of equipment also rely on a host of support equip- ment. With conventional mining processes, dozers clear the bench for the shovels, while front-end loaders keep the loading area clean, reduc- ing tire damage on the trucks. Sometimes those same loaders can be the primary loading tool. Likewise, drills punch holes into the bench so that crews can load and detonate blasts to fragment the rock formation. Others are looking beyond conventional load-and-haul strategies to more continuous material handling methods, such as in-pit crushing and conveying (IPCC). 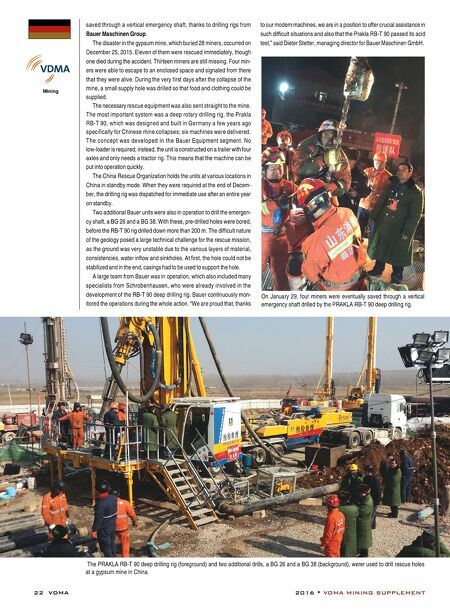 These systems could also be used in connection with continuous mining systems, such as surface miners and bucketwheel excavators. Liebherr Launches New Excavator and Dozer With an extensive range of equipment for loading, hauling and support, Liebherr is the leading German equipment manufacturer for large scale surface mining equipment. The mining business has partnered with the company for half a century, allowing it to build a solid reputation for the development and production of world-class excavators, haul trucks and other ancilllary equipment. A classic example is the recently announced R 9200, which combines tradition with innovative thinking, to overcome any challenge, accroding to Liebherr. The R 9200 was built to complement the company's broad range of mining class excavators. Equipped with a 12.5-m 3 bucket, the company said it offers sustainable performance while delivering peak fuel burn efficiency, even in the most challenging conditions. The exca- vator is a pass match for 140-metric-ton (mt) payload haul trucks. The R 9200 is available in backhoe and face shovel configuration and is fitted with the company's advanced bucket and GET solution. The buck- et has been engineered to deliver superior digging performance and high fill factors, according to Liebherr. This new excavator is powered by the Cummins QSK38 diesel engine that complies with USA/EPA Tier 2 or 4i exhaust emission limits and has a rated output of 810 kW (1,086 hp). The cutting-edge cab of the R 9200 provides the operator with a panoramic view of their operation, which leads to efficient truck loading and safe machine positioning. The R 9200 integrates an advanced electronic pi- loting control system, which is both intuitive and versatile. The Liebherr R 9200 excavator is equipped with the Litronic Plus system, an intelligent power management system that enhances elec- trical, mechanical and hydraulic power distribution. Combined with a closed-loop hydraulic swing circuit, this class-leading system means the Liebherr Aerial: The Liebherr R 9200 loads a 140-mt haul truck with its 12.5-m 3 bucket.